Group of local Aboriginal people, Chowilla Station, Lower Murray River, South Australia, from the album New South Wales Royal Commission: Conservation of water. Views of scenery on the Darling and Lower Murray during the flood of 1886. 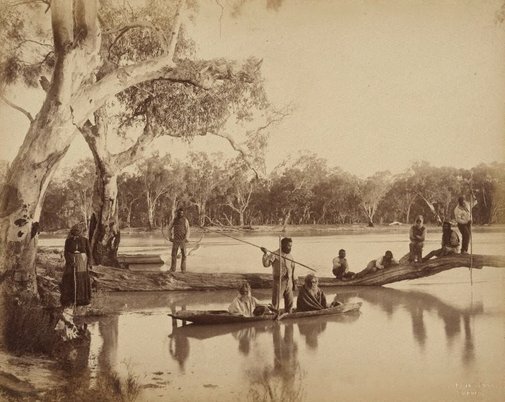 Throughout the 19th century there was a prevalent view among the white population of Australia that it was only a question of time before the last Indigenous Australians disappeared from the mainland. In response to this, and as a reflection of more general interests in ethnography current at the time, photographers frequently represented Aboriginal subjects. Their images usually took the form of tableaux or more consciously ethnographic studies, with subjects unadorned or naked, as ethnographers had advised. Georgina Cole, Look , 'Australian photographs past and present: What they say about the people and the country', pg. 26-30, Sydney, Mar 2015, cover (colour illus. ), 28. Robyn Donohue, Look , 'Arcadia: Nineteenth Century Australian Photography', pg. 22-23, Heidelberg, Oct 1998, 22. Elizabeth Maloney, Look , 'Charles Bayliss', pg.39, Sydney, Mar 2008, 39 (illus.). Steven Miller, Photography: Art Gallery of New South Wales Collection , 'In every house, and in every tent', pg.33-51, Sydney, 2007, 49 (illus.). The photograph and Australia , Sydney, Jun 2015, 41 (colour illus. ).